June passed by like a whirlwind for me. One minute it was here and the next, gone. July, ever so sneaky, crept up on me faster than a sunburn in the hot sun (and I unfortunately have a fair number to judge this against). Out here in the Midwest, summer is finally, finally hitting its stride. Spring coats have hesitantly been packed away. Shorts and flip flops dot the streets. Warm breezes brush against legs and blow softly through hair. It feels good. It wasn't until Thursday of this week that I even realized the Fourth of July was this weekend. A coworker began talking about her weekend plans when it finally hit me. Somehow the vivid red, white, and blue colors that line store shelves, paint the streets, and dress the front of homes managed to escape my eyes. Even the calendar that hangs directly on the refrigerator slipped out of my vision. I did, however, notice that the berries were an unusually low price in the supermarket. Score one in my favor? Nevertheless, I did have a small moment of panic. Did I already have plans? Should I plan something special for the day? What was I going to do? But, more importantly, what was I going to bake? The Fourth of July is, no doubt, a holiday surrounding the grill. This is the true season for hamburgers, hotdogs, and a large bag of chips. It's a chance to separate the men from the boys when it comes to the fine art of barbecuing. Or, in some cases, the women from the girls (my mother can wield a mean pair of tongs). Like most holidays, I recognize them in the way my family chooses to eat. Whether we're at a potluck with friends or simply sitting around the table on the deck by ourselves, the grill is ever present. My mother usually tries to make this holiday special by grilling up meat and vegetable kabobs with big ears of corn. When I was younger, I wanted to do my part, too. For many years, I secretly whipped up a batch of vanilla instant pudding in the early morning hours. I would dye it red, white, and blue, layer it neatly into parfait glasses, and "surprise" everyone with a festive dessert. After a couple years, it became less of a surprise and more of a tradition, but the simple magic of a red, white, and blue dessert was never lost. And so, when it came time for me to decide on a Fourth of July dessert for this year, I asked you for help. Now that I'm a baker, my family expects a little more from me than an instant pudding mix. One of you wisely suggested an old fashioned pie. Perfect. What could possibly be more American than pie? Plus, a good pie also represents independence—well, independence from a healthy diet. But, I wanted to take my pie a step further. Let's be real here; pie is messy. It's hard to cut. The filling likes to ooze out of the crust despite any orders and desperate pleas you may give it. And, though pie is delicious, it isn't necessarily a good dessert for summer potlucks. Until now. Hand pies are the perfect solution to this pie conundrum. Easy to make, easy to eat, no mess, no forks, no berry stained plates. Though you may spot a few berry stained faces. Have a happy Fourth of July, dear American readers! I hope it is filled with laughter, love, delicious food, the boom of a good firecracker, and the glow of flickering bonfire. Or, if you just so happen to be British, I offer you my condolences on this anniversary of your loss of a great colony. And, for the rest of you, I sincerely hope you have a lovely Monday. 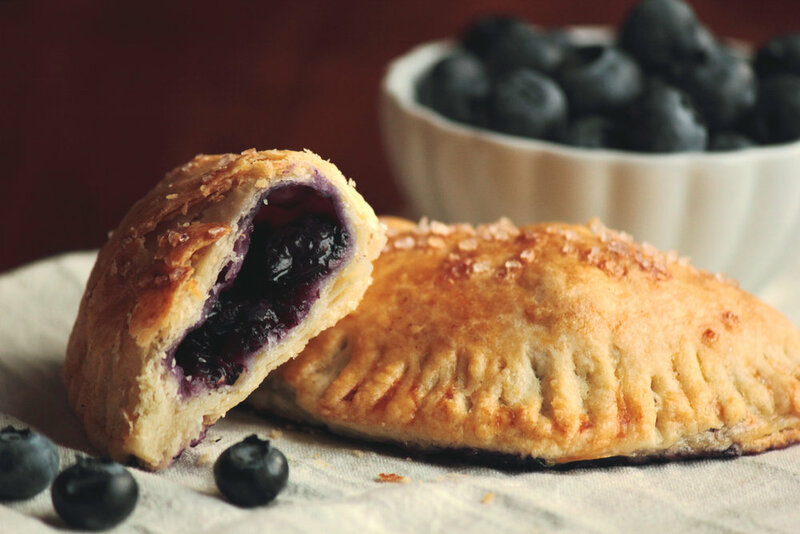 These Blueberry Hand Pies are the perfect summer potluck food. The flaky, buttery pie crust holds in the rich blueberry filling, keeping it well contained. A sprinkling of sugar completes the golden picture. I love these hand pies because they already come in individual portions and they are no mess, no fuss when it comes to eating them (especially wonderful for those of you who hate doing dishes). I hope you'll find you love these little hand pies too. Chill the pie dough for at least 1 hour before making hand pies. In a small bowl, whisk together the sugar, cornstarch, cinnamon, and lemon zest. Set aside. In another bowl, coat the blueberries with lemon juice. Sprinkle on the sugar mixture and stir until blueberries are evenly coated. Roll out chilled pie dough to 1/8 inch thickness. Cut out circles approximately 5-6 inches in diameter (I used the rim of a 5 1/2 inch diameter round bowl to cut out circles). Fill center of dough circle with blueberry filling. The amount you can fit inside will depend on the size of your blueberries (I was able to fit 2 tablespoons of filling in each hand pie). In a small bowl, whisk together the egg yolk with two tablespoons water. Brush egg wash on edge of dough circles, fold in half, and seal the edges with a fork. Chill hand pies for at least 1/2 hour before baking. Remove pies from refrigerator and brush with remaining egg wash. Sprinkle on sanding sugar and cut a small slit in the top of each pie to let out steam. Bake for about 20 minutes, or until pies are golden brown and flaky. Cool to room temperature before serving.